It’s Clear…THE FOG Blu Ray is a WINNER! It has been mentioned many times on this site that John Carpenter’s THE FOG is a favorite movie of both Daves. Unfortunately, up until recently, good quality versions of this film have been non-existent. Even the blu-ray that was available as an import on Amazon for so long was just a blu-ray version of the MGM Special edition that came out many years ago (in other words, it was less than perfect). Once again Shout! Factory has gone to great lengths to provide us with a great release in its best form to date! These guys know what they are doing and know what the fans want! This film just all around is a lot of fun. It has a great ensemble cast, creepy atmosphere and an awesome musical score by John Carpenter. It is a ghost revenge story at its best and is nothing short of a classic. The basic story goes like this: a clipper ship, the Elizabeth Dane, is lured to its destruction off the shore of Antonio Bay, not only for the gold on board but to prevent the lepers onboard from setting up a colony nearby. On the 100 year anniversary of this event, the ghosts of the ship’s crew return to kill six people as revenge against the six original co-conspirators of the sinking. The new transfer for this release is very clear with sharp colors, making it hard to believe that this movie came out in 1980. More detail is evident in even the darkest of scenes and subtle sound effects are more apparent, adding to the overall creepiness of the film. All of the actors also do a great job in their respective parts. I am usually not a fan of the extras on DVD and blu-ray releases but I must say, the new ones that have been included on the Shout! Factory discs are really worth checking out. On this release there is a cast interview from 1980 talking about the film as well as a recent one done with Jamie Lee Curtis, who actually says she doesn’t like the film! One of my favorite parts of the extras on these discs have been the “Horror’s Hallowed Grounds” segments, which features Sean Clark (the writer of THE BLACK WATERS OF ECHO’S POND) visiting the original filming locations of the featured film. Sean has been a regular contributor to HorrorHound Magazine with his “Horror’s Hallowed Grounds” articles and now you can actually enjoy video footage of the very interesting and entertaining Clark as he visits these places, showing how they have changed over the years. Sean is one of us; a fan that loves and appreciates these films and it really shows how much he respects the genre in these features. I was fortunate enough to meet the very beautiful Adrienne Barbeau, who plays DJ Stevie Wayne, awhile back. You never know what an actor is going to be like when you meet them but Adrienne was charming and a lot of fun to talk with. She didn’t rush you along after you paid for your autograph and genuinely enjoyed talking to the fans. 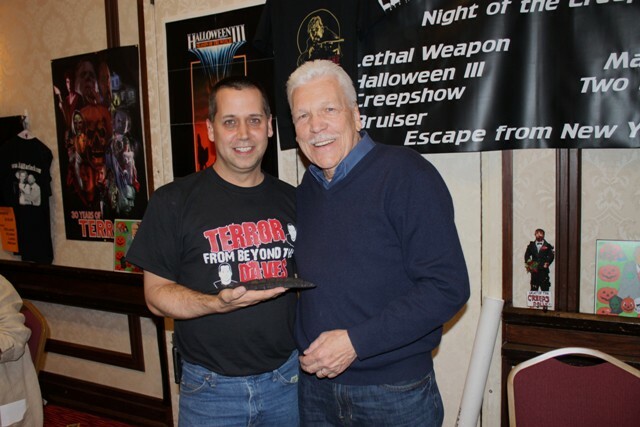 Tom Atkins is another fun person to meet as he is full of energy and loves to talk about his career (in a non-bragging way) and his fans. He has a great sense of humor and spent most of the time laughing when I met him. Atkins was a staple in 80’s genre films and our lives are better for it. For me the release of this disc was the best news I had heard in a long time. In my opinion no film has deserved this kind of treatment as much as THE FOG does. Thankfully, Shout! Factory is continuing to impress with their classic 80’s horror movie releases. Go out and buy it today right HERE! This entry was posted in Big 80's Horror!, DVD/Blu-Ray Review and tagged Adrienne Barbeau, The Fog, TOM ATKINS. Bookmark the permalink. ← Nancy Loomis cuts through THE FOG at Flashback Weekend!